Simply put, Skorkowsky’s Valducan Series has grown its beard with Valducan #3: Ibenus. One part epic scope of Valducan #1: Damoren, one part intimate horror of Valducan #2: Hounacier, and one part expansion of the series universe and mythology all its own, Ibenus is the best of the series yet. Ibenus fleshes out the Valducan Order in a rich, full, and deeply personal way. In Ibenus, Skorkowsky gives us the grand tour of what it truly means to be a Valducan Knight — bonded and wed to one of the Holy Weapons, pledged and sworn to their brothers and sisters. Becoming a Knight is an exercise in love, pain, and conquering the darkest of fears. All while staying one step ahead of those who are out to destroy you. Skorkowsky takes the highs and horrors of a demon hunter’s life head on, flinching away from nothing. Ibenus follows the first days on the hunt for newlywed Knights and also treats us to the return of many beloved faces, dragging all of them side-by-side into the surreal, demon-infested dark of the Paris Catacombs. The ancient, claustrophobic underworld of Paris is, quite possibly, the ultimate setting for a modern demon hunt. Once you descend into Skorkowsky’s lightless below, you might as well be on another world. One of dust and mud and the mad scribblings on the walls of those who have come before you. One where every shadow could hide a hungry demon, and the only thing holding back the devouring blackness is the pale, meager glow of your flashlight. Prepare to have your claustrophobia and fear of the dark put to the test on this express elevator to Hell. Down here, with the Valudcan Knights, it’s not a question of *is* the monster behind you… but *when* it will catch up to you. 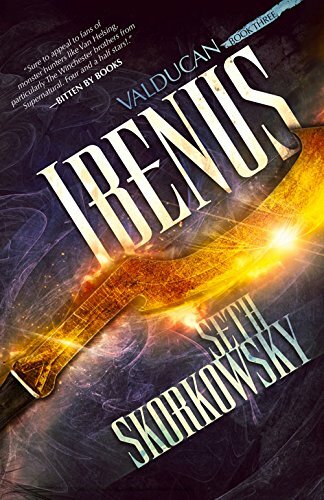 Ibenus is a first-class addition in every respect to Skorkowsky’s world of the Valducan Order. Check it out on Amazon, Goodreads, and the Author’s Website.